Jagannath University Admission Test Circular 2017-18 has been published. Jagannath University Admission Test Circular 2017-18 has been published. Jagannath University Admission Test Circular 2017-18 will be the beginning date of 08 August to 31 August, 2017. Jagannath University Admission Test Circular 2017-18 and Admission related all information will be found in Jagannath University Official website at www.admission.jnu.ac.bd or www.admissionjnu.info & our website www.bdresultjob.com as well. Alter!!! 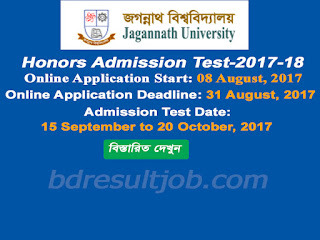 Dhaka University and Jagannath University Admission Test same date. Dhaka University Examination Morning time 10.00AM and Jagannath University Examination evening time 3.00PM. D. Follow A,B and C unit for Minimum GPA in SSC and HSC level. But minimum A-(A Minus) in English and Bangla in HSC level. a. Visit http://admissionjnu.info and login with your SSC, HSC roll number, Passing year and education board to check eligibility for A,B,C,D and E Unit. b. If you are Eligible to apply for your Unit input your mobile number and submit it. c. There are an application ID Number will be generate like XXXXXX. Reserved the application ID. d. Login again JnU Admission Website System (www.admission.jnu.ac.bd or www.admissionjnu.info ) Appliaction ID and SSC and HSC roll number. F. Fill up Quota information and subject preference list. h. Application Fees for A,B,C and D unit is TK. 505/- and For E unit is 606 Taka. i. After complete your all information check carefully, that’s all ok submitted your application finally and print out it. Jagannath University will be published the details seat plan on their official admission website http://admissionjnu.info. Also JNU authority will be notify the application by Mobile phone SMS. Jagannath University as soon as possible admission test result. It’s within 1 week. Jagannath University will be published the result on their official admission website http://admissionjnu.info. Also JNU authority will be notify the application by Mobile phone SMS. After result successful student JNU authority invite subject choice form fill up in http://admissionjnu.info. Tags: www jnu ac bd. jnu ac bd. jnu seat plan. JNU RESULT. জগন্নাথ বিশ্ববিদ্যালয় admit card. জগন্নাথ বিশ্ববিদ্যালয় a unit result. jagannath university admit card. Jnu admission. jagannath university admission result. admission jnu ac bd. jnu a unit result. jnu a unit seat plan. jnu seat plan a unit. jnu a unit merit list. jagannath university A unit seat plan. jagannath university seat plan. ju ac bd admission 2016-17. jnu admit card. JNU A UNIT RESULT 2016-17. jagannath university admit card download. 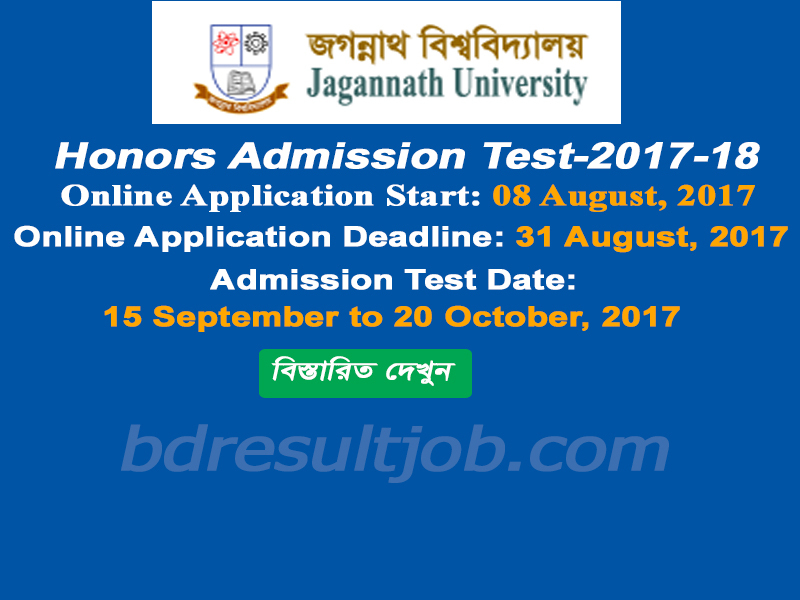 Bangladesh Education and Job Portal: Jagannath University Admission Test Circular 2017-18 has been published.